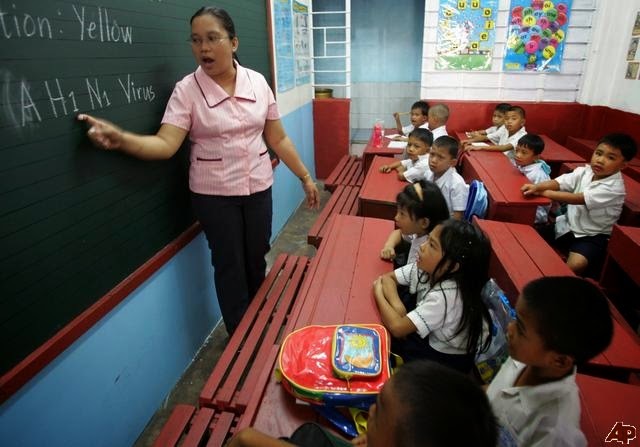 Manila, Philippines - Senator Loren Legarda announced on Friday a proposed measure seeking to increase the minimum salary of public school teachers and non-teaching personnel. Under Senate Bill No. 2351, Legarda proposed that the present minimum salary of public school teachers in the elementary and secondary schools be upgraded from P18,549 to P25,000 a month. The salaries of those occupying higher positions shall be adjusted accordingly. Meanwhile, the minimum salary of non-teaching personnel, who provides support to teachers, will be increased from P9,000 to P15,000 per month. "This bill aims to raise the salary of public school teachers and its non-teaching personnel to ensure that the State fulfills its responsibility of ensuring adequate compensation for teachers and to prevent our competent and efficient educators from leaving the country for better opportunities abroad," said Legarda. She stressed that Republic Act 4670, or the Magna Carta for Public School Teachers, protects the rights of public educators to a decent salary by ensuring that compensation levels compare favorably to those paid in other occupations requiring equivalent qualifications and that they ensure reasonable standard of life for themselves and their families. "The country can only move forward in the global knowledge economy if government ensures that it invests enough on improving its human capital," said Legarda. The proposed measure also ensures that appropriation for the salary increase of teaching and non-teaching personnel in public schools shall take priority over non-educational and non-agricultural budgetary allocations.